Ruthless Morton thumped Beith Juniors 6-0 at Bellsdale Park to reach the fourth round of the Scottish Cup. Annan Athletic crashed out of the competition with a 4-0 hammering by Highland League Formartine United. Stirling and Stranraer progressed at the expense of junior opponents, beating Wick Academy and East Kilbride respectively. And Colin McMenamin's hat-trick ensured Stenhousemuir knocked out Forres Mechanics in their replay. 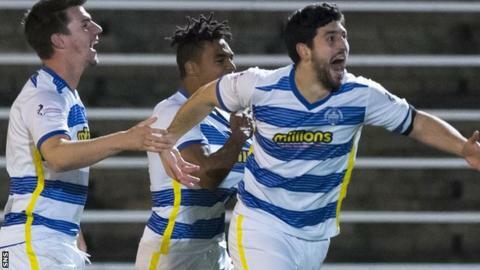 Championship side Morton gave their West of Scotland Super League Premier Division opponents no chance thanks to Thomas O'Ware's second-half brace along with goals from Ross Forbes, Michael Tidser, Jamie McDonagh and Jamie Lindsay. A crowd of 1693 watched the Scottish Junior Cup champions bow out to an in-form Ton, who will play Falkirk at Cappielow in the fourth round. "We played well today," said Morton boss Jim Duffy. "In the first 10 minutes we expected an onslaught and it wasn't quite an onslaught, but Beith certainly put us under a bit of pressure in the opening few minutes. "We got the early goal and relaxed and played very well after that. It was a proper, old-fashioned Scottish Cup tie in a venue that was a strange environment because of the sloped pitch. You don't get too many pitches like that but the playing surface was very good. "The most important thing today was winning and we managed to score a few goals which always gives the players confidence." Beith manager John Millar admitted his side's professional opponents were a cut above. "We were brilliant for the first 10 minutes but then we lost a cheap goal," he said. "It's the best team I've seen close up playing against us. Before the game I was saying it would be interesting to see what the standard is, but that's just a step up. They're all athletes; they're a professional side. "The fans were brilliant and cheered us coming off. Our big picture is the league and trying to retain our Scottish Junior Cup." At North Lodge Park, League Two Annan slipped to a devastating defeat as Conor Gethins netted a second-half hat-trick for Formartine, and Scott Barbour was on target with their third. Annan's League Two rivals Stirling progressed with a 2-0 home win over Wick Academy thanks to a close-range Blair Henderson effort and substitute Dylan Bikey's second-half addition. League One Stranraer fought back from 1-0 down to rescue a late 2-1 win over East Kilbride. Sean Winter's opener handed the Lowland League side the advantage but Willie Gibson bagged a 26th-minute penalty before a headed own goal from Adam Strachan put the Blues through. Elsewhere, in Saturday's third-round replay - after the scores were level at 2-2 last weekend - McMenamin fired home a treble as League One's Stenhousemuir claimed a 3-1 defeat of Forres Mechanics. Liam Baxter scored a consolation penalty consolation late on as both sides finished with 10 men after David Marsh was dismissed for the Warriors and Craig McGovern for Forres.